New York City elites’ go-to-dietitian Tanya Zuckerbrot says top executives are eating up her high-fiber regimen. Katie Couric is doing it. So is supermodel Molly Sims as well as a slew of New York City’s elite. “We have CEOs and CFOs from all disciplines whether it’s finance or fashion. We’re really dealing with people who work hard, but still want to play hard, therefore we have to cater to their lifestyles,” Tanya Zuckerbrot, CEO of F-Factor, a weight management and nutrition counseling center in New York City tells FOXBusiness.com. Zuckerbrot is a registered dietitian and founder of The F-Factor diet, a fiber-rich weight loss program that has high-profile clients paying upwards of $15,000 dollars to get her diet advice. “I charge $15,000 dollars for my startup package which includes an initial consultation and a two-hour education class as well as follow-up visits. My associates charge $4,500 for their packages,” she says. Zuckerbrot says the education part is the key to her success, as well as her clients. “Unfortunately, there is a lot of misinformation in the weight loss space. People have not been provided the right plan, so we take the time here to educate our clients rather than dictate to them and we explain the science behind our principals,” she says. That science is adding fiber-rich foods like fruits, vegetables, and GG Bran Crispbread crackers, her secret weapon, to every meal with a protein. “That cracker is the cornerstone of F-Factor. We use it instead of bread because your body can’t break it down so you get to eat these throughout the day and feel super full. It’s also revving up your metabolism so you’re going to lose weight without hunger,” says Zuckerbrot. 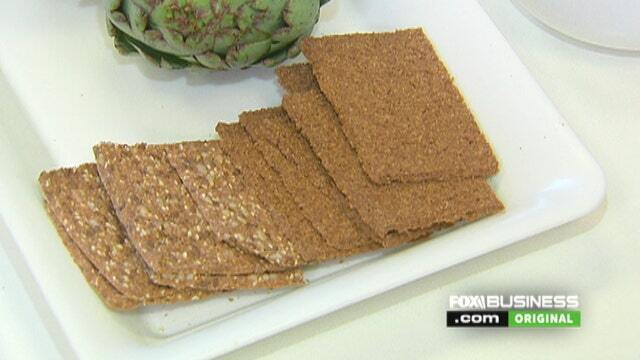 GG Bran Crispbread, is an appetite control cracker that is grown in Norway and manufactured by Health Valley Company, a division of The Hain Celestial Group Inc. Each cracker contains four grams of dietary fiber and only 20 calories per serving. “It boosts your metabolism, it absorbs fat and calories and leaves you feeling full,” she says. The U.S. Department of Agriculture recommends 14 grams of fiber for every 1,000 calories consumed. So, if a person is eating 2,000 calories a day, they should aim to get 28 grams of fiber daily. “We recommend 35 to 40 grams of fiber a day. Unfortunately, we’re in a fiber deficiency. We have refined all of our foods and the average American is only eating 9 to 11 grams of fiber a day,” says Zuckerbrot. F-Factor generates over a million dollars a year in revenue but Zuckerbrot knows her price point isn’t for everyone.